Has your daughter ever cried whilst her hair was combed or stared in the mirror in dispair because it doesn't like the girl's in the L'oreal advertisements? It's not easy trying to get your child to see the beauty in their hair when they are constantly bombarded with images of straight hair and the latest must have is a pair of GHDs. Exposing your child to the wide range of styles that can be achieved with their hair is important in establishing a sense of pride and self esteem about the way they look. 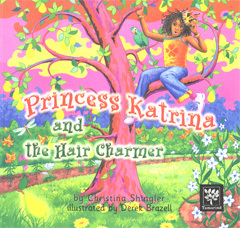 Princess Katrina and the Hair Charmer is a great starting point. Not only is Princess Katrina a princess that looks like a mixed-race child, she also has problems looking after her hair. Finally a book to help children and parents understand that they are not alone and that with a bit of know how, patience and love hair care can be fun. Princess Katrina and the Hair Charmer by Christine Shingler is available to buy now.